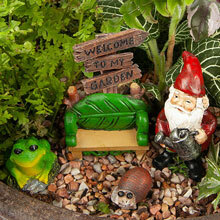 Let your imagination run wild and free with our magical fairy gnome garden. 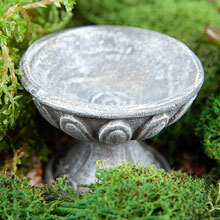 Perfect decoration during any season, this set comes with 6 unique pieces that make any home a welcoming one! 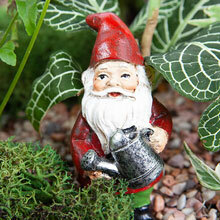 The gnome fairy garden can be positioned indoors or outdoors depending on where you see fit and brightens up any atmosphere. Find your favorite spot: a cozy reading place, your office desk, the patio-the list goes on. 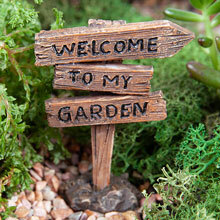 This magical set can be combined with any other accessories to come up with countless scenes to transform your garden from ordinary to extraordinary. 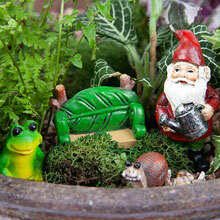 •UNIQUE AND PERSONAL: Build your own gnome garden with this six piece set, they are the perfect size to place in many areas of your miniature garden creating your own unique gnome world. 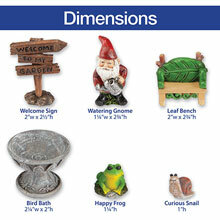 •PERFECTLY SIZED: This miniature collection feature all of these charming individual pieces, Gnome (2¼" high), Sign (2½" high), Fountain (2" high), Frog (1¼" high), Bench (1½" high) and a Snail (1" high). •QUALITY MATERIALS: Made out of durable high grade resin, every piece in this unique set is hand painted and has a protective coating to ensure that they don't fade in the sun. •WHIMSICAL AND CREATIVE DESIGNS: Enhances the appeal of any garden setting by adding charming whimsy to your flower gardens, also makes terrific indoor humor in flower pots and terrariums. •MAKES A PERFECT GIFT: For children, grandchildren, wife, mother or girlfriends, this set create a truly special gift for any occasion.